Sleep apnea in children, infants and toddlers is more common today than it was in any other generation. Obesity, large tonsils or adenoids, a narrow upper airway, may trigger obstructive sleep apnea in kids. 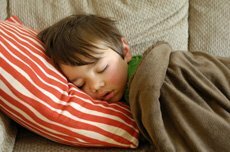 If you hear your child snoring in his sleep, look inside his mouth for his tonsils or adenoids. Does he have swollen tonsils? Enlarged tonsils or adenoids are the main causes of sleep apnea in children. Although tonsillectomy and adenoidectomy are the best treatments for pediatric sleep apnea, they are ineffective in curing 30% of the children. I remember a three-year-old Ann's mom, Angela, who was full of anxiety about her child. She said that every night Ann slept, the child would stop breathing from time to time. Just as Angela thought Ann would never take another breath, Ann would snore and snort and resume breathing again. She taken her to sleep in the same bed with her, in case she needed to wake her up to start breathing again. She was really worried. Note: Since a child is unaware of his breathing problems in the night, a parent's effort to help his child is crucial! There are parents who don't realize that their child has a sleep disorder. It's so funny when my child snores...said a parent. Well, when a child snores, something is not right. Snoring is the most obvious symptom of OSA in children. So, if you hear your child snoring, don't laugh but be careful at his sleep. Heavy snoring with loud snorting is a sign of severe obstructive sleep apnea. What Causes Sleep Apnea in Infants, Toddlers and Children? Swollen tonsils, weight gain and body mass index are the most common risk factors. There is so much more to say about the risk factors of sleep apnea in kids. For more info, see Causes of Sleep Apnea in Infants, Toddlers and Children. What are the Symptoms of Sleep Apnea in Children? Does your infant, todlers child has one or more of these symptoms? Poor performance at school, such as poor concentration, behavioral problems and lack of learning. A sleep apnea symptom, such as behavioral problems and poor concentration, can affect a child for the rest of his life. Therefore, you should act immediately in treating sleep apnea, if your child has this disorder. Sleep apnea in infants may cause sudden infant death syndrome (SIDS), which is a fatal syndrome that affects babies usually between 1 and 12 month of age. This unexplained death may appear at healthy babies, too. Click here to learn more about SIDS. Children are more difficult to diagnose than adults, and can easily be misdiagnosed by doctors. If you think that your child has a sleep disorder, visit an accredited sleep center for a sleep study. Some of the sleep apnea symptoms differ in children and adults with sleep apnea. The children with sleep apnea are hyperactive or aggressive. They are not necessarily sleepy as adults with sleep apnea. Therefore it would be wise to look for a sleep specialist who is experienced with pediatric sleep apnea and other sleep disorders. Because most obstructive apnea in children are caused by enlarged tonsils and adenoids, the most frequent treatment is simply to remove them. The operation - tonsillectomy - has some risk but is fairly routine. However, at least 30% of children who have tonsillectomy and adenoidectomy will still have sleep apnea and need further treatment. Continuous Positive Airway Pressure (CPAP) is another treatment for children whose obstructive sleep apnea is not or cannot be resolved by tonsillectomy. CPAP can be successful in a child with sleep apnea if he is able to understand how the mask and equipment work and when the parents are cooperative.